COLUMBIA roll stamp holders, developed to efficiently mark both flat and contoured surfaces, are designed to hold individual step style wedge stamps or combinations of wedge stamps, logo-stamps, and segment dies. The step in the cover plate retains the stamps in the holder while a take-up plate, provided with each holder, holds the stamps in perfect alignment. Dim. Use in Roll Carriage Cat. No. 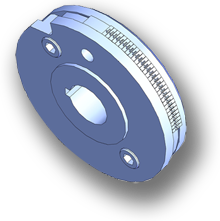 The hub extends 1/16” past the cover plate allowing the plate to be released while the holder remains firmly locked in the carriage. Release of the cover plate allows all stamp changing operations to be carried out while the holder remains in the carriage, a truly time-saving feature. 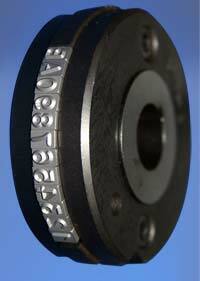 COLUMBIA wedge type steel stamps are designed to fit into our series RM roll type holders. The step style steel stamps were selected for our standard stamps because of the additional strength afforded by this proven design. Blank spacers are required where number of characters needed is less than capacity of holder slot. Style W standard wedge stamps have a wedge angle generated by a 3” marking diameter.